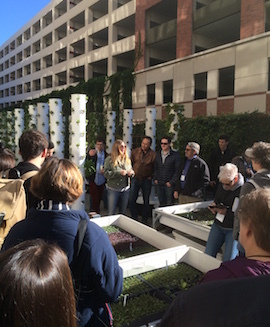 Attendees of the Seedstock ‘Future of Food – Urban Ag Field Trip’ at USC Teaching Garden, learning about the farm’s aeroponics operations from LA Urban Farms’s Wendy Coleman and Niels Thorlaksson. Photo credit: Robert Puro, Seedstock. 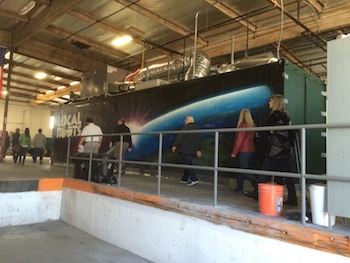 On Friday, January 27, Seedstock hosted the inaugural ‘Future of Food – Urban Ag Field Trip’, which provided attendees an excursion into the diversity of urban farming and state-of-the-art hydroponic, aquaponic and aeroponic agriculture operations in Los Angeles County, the most populous county in the U.S. The sold out tour treated participants to lectures and sessions from pioneering farmers who are embracing innovative business models and growing systems to both increase food security and take advantage of the escalating demand for local food. The tour kicked off with a stop at The USC Teaching Garden, a joint venture between L.A. Urban Farms and USC Hospitality, which utilizes aeroponic tower gardens to challenge the food systems status quo on campus. The garden was established to supply fresh produce to the university’s on-campus restaurants, dining halls, catering services, and hotel, while also teaching students and staff about flavor and sustainability. Attendees heard from Chef Eric Ernest, Executive Chef of USC Hospitality, discuss the economic viability of the garden. Chef Ernest noted that the garden is not just for show, and that its 90 aeroponic garden towers grow enough food for campus retail units to break even each year. “The garden is about connecting chef and customer,” said Chef Ernest. We also heard from L.A. Urban Farms founder Wendy Coleman, and partner Niels Thorlaksson, discuss the technical details of the farm, its water usage, and maintenance requirements. Thorlaksson explained that each aeroponic garden tower utilizes 5 – 10 gallons of water per week. The second stop on the field was Vernon, CA-based Local Roots Farms, an indoor vertical farming company based in Los Angeles that designs, builds, deploys, and operates controlled environment farms. Situated in up cycled shipping containers, the farms (called TerraFarms) grow with up to 99% less water, 365 days a year, pesticide and herbicide free, and with absolute consistency in production. At Local Roots Farms attendees learned from Allison Towle, the company’s director of corporate development, about the company’s business model, fundraising efforts, and products. “The goal is to feed people,” said Towle. “We’re trying to grow food that is fresh, nutrient dense, and affordable to feed the world.” A farm-to-fork lunch from field trip sponsor and Local Roots Farms customer Tender Greens followed. The lunch utilized lettuce grown on site in the company’s TerraFarms, and also featured an address from Christina Wong, director of pr and marketing for Tender Greens, on the company’s effort to embrace urban farms to source food locally in cities. “Urban agriculture and vertical farming will be a big part of our supply chain as we grow,” said Wong. 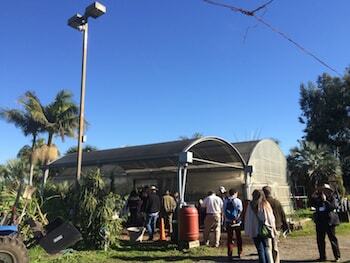 The tour then headed for its final stop at The Growing Experience Urban Farm in Long Beach, CA. On the bus trip from Vernon to Long Beach, Dr. Rachel Surls, sustainable food systems advisor for UC Cooperative Extension and co-author of “From Cows to Concrete: The Rise and Fall of Farming in Los Angeles,” discussed the past, present, and future of urban farming in Los Angeles. Surls discussed challenges faced by urban farming operations. “Unhappy neighbors are a surprisingly large challenge for urban farmers along with city codes, policy, and investment,” she said. Surls also noted that there is a tension between improving food justice and running an economically viable urban farm. At the final stop on the tour at The Growing Experience Urban Farm, a seven-acre urban farm in North Long Beach that is located on a previously vacant lot within the Carmelitos public housing development, attendees learned from program manager Holly Carpenter and field specialist Adan Cisneros about the farm’s effort to increase food access, implement sustainability measures, and plant foods that meet the needs of the housing development’s resident. The urban farm, which is managed by the Housing Authority of the County of Los Angeles, utilizes traditional as well as aquaponics growing systems to help meet the needs of the community by increasing access to healthy foods. Attendees learned about how the farm is utilizing tons of food waste, which would otherwise be destined for the city’s land fills, as compost. 1. L.A. Kitchen Founded by Robert Egger in 2013, L.A. Kitchen is located in a 20,000 sq. ft., two-level processing kitchen, in NE Los Angeles. L.A. Kitchen believes that neither food nor people should ever go to waste. By purchasing and reclaiming cosmetically imperfect fruits and vegetables, which would otherwise be discarded, and using them to train and create culinary jobs for unemployed men and women, we make scratch-cooked, healthy meals for the community. Attendees will be treated to a farm-to-fork lunch prepared by L.A. Kitchen. 2. Seeds of Hope‘s Edendale Grove Farm. Seeds of Hope is a ministry of the Episcopal Diocese of Los Angeles which seeks to help congregations, communities, and schools turn unused land into productive gardens and orchards to provide healthy and fresh food in areas of need across the county. Over 80 institutions of the Diocese of Los Angeles have urban gardens and are distributing food to those in the community. 3. Los Angeles Community Garden Council (LACGC)‘s Lavender Hill Urban Farm. LACGC manages 40 community gardens in Los Angeles County. The garden types that the council manages include the following: traditional community gardens where people rent a plot to grow their own fresh produce; educational gardens where LACGC teaches gardening, landscaping, nutrition and cooking; and urban farms where volunteers grow vegetables for local markets and people in need.